On 10-4-18, I saw Tremonti at RocHaus in West Dundee, IL. HOLY you know what! What. A. Show. WHAT. A. FREAKIN. SHOW. Seriously. Look at that set list! I’m no stranger to seeing Tremonti, but I swear the level of speed, heaviness and all around bad-assness I have witnessed in the past was elevated by 1000% last night. It was at some point during this set that I realized I have been following Mark Tremonti’s career for 20 years. WHAT?! With all the various band album anniversaries this year I swear it feels like the past 20 years have flown by in blink of an eye. Geezus. Back story time. I got into Creed on their first album, My Own Prison. Honestly, to me anyway, it’s still one of the BEST albums. I saw them live for the first time at one of the ground stages at Summerfest in Milwaukee, WI July 3, 1998. I would go on to see Creed several more times thru 2002 and again in 2009 for the reunion show (Where I discovered Like A Storm!). With the release of One Day Remains in August 2004, Alter Bridge were fully on my radar and it was such an awesome album! They also toured and my first AB show was Oct 2, 2004 at The Rave in Milwaukee. This was also the first time I ever attended a show by myself. You see, neither my husband or my friends wanted to go with me. Well, I wasn’t going to let that keep me from seeing a favorite band and I am so glad I went! I would continue to see Alter Bridge thru 2017. As long as the band keeps touring, I will continue to see them live. July 2012, the world was exposed to Tremonti with the release of All I Was, the heaviest project Mark Tremonti had released and MAN ALIVE DID IT KILL. SO HEAVY. Once again, I saw the band live (with Wolfgang Van Halen on bass even! Well, in the beginning anyway) and would continue to see them a handful more times, which brings us up to the October 4, 2018 RocHaus show. Well, technically, through October 9, 2018. See, a friend had an extra ticket to the show in Milwaukee and asked if I wanted to go. Sure! Who cares that I had just seen them a few days prior! That’s Rock ‘n’ Roll! Back to the RocHaus show. I purchased another copy of A Dying Machine so that I could meet the band after the show. Everyone was super nice and it was cool to talk briefly with everyone. Although, I felt like I talked Mark’s ear off because I was trying to get in as much as I could before I had to move along. Once through the line, I met up with my friend and I “casually” joined in on her plan to get back in line to get a photo with the band, while talking with someone else I knew who was at the end of the line. Sometimes patience pays off. Such a great night! Jumping to the Oct 9 show in Milwaukee… another FANTASTIC SET. Although, because they were opening for 10 Years, there were a few less songs in the set. However, they played My Last Mistake, which wasn’t played at the RocHaus show. 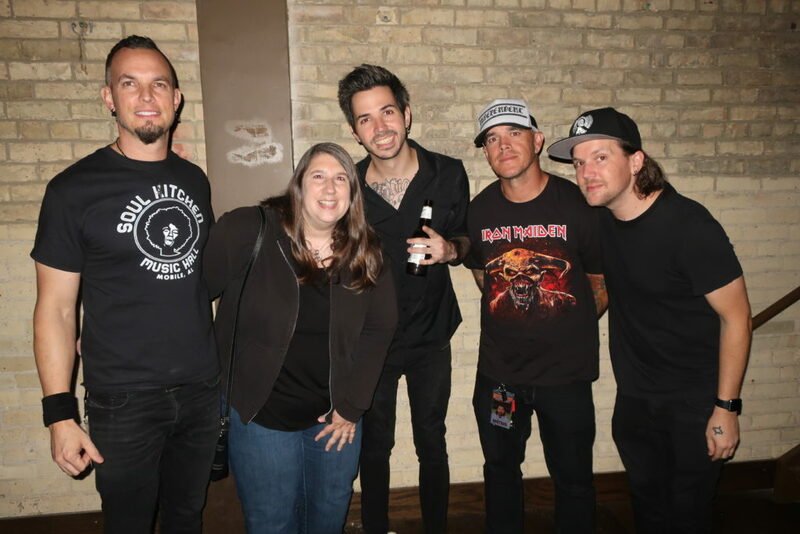 The band was hanging around after the Milwaukee show so I chatted briefly with them again and was able to have a longer convo with Mark, along with my friend. He was SO laid back and really enjoyed talking about his book, with the same name of the album, A Dying Machine. At one point, I felt like I was on another planet because I pretty much said to myself, “How is it I’m standing here talking to Mark FREAKIN’ Tremonti? !” Oh and at RocHaus I forgot to mention to him how much I loved Flying Monkeys so I thanked him for playing it at both shows. He said that it would always be in the set since it was his 2nd fave song. His first? A Dying Machine. HELL YES! ©MuzikFreak.net 2002 - 2019. All Rights Reserved.